Rinse barley with cold water. Place in a medium saucepan and cover with plenty of fresh cold water. Bring to a boil and then simmer for 30-35 minutes, intil tender but still with a bite. Drain barley and transfer to a mixing bowl. Combine Olio Pedro Ximenez Sherry Vinegar, garlic, all spice and some Olio Himalayan Pink Sea Salt and pepper. Slowly drizzle in the Olio Hojiblanca Extra Virgin Olive Oil to create an emulsion. Add this to the warm barley, along with the celery. Allow to cool completely. 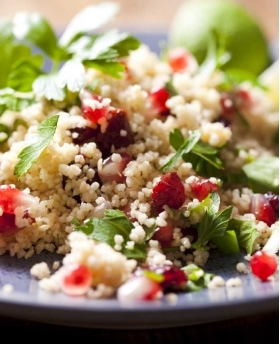 Once the barley mixture has cooled, add the herbs, celery leaves and pomegranate seeds and mix. Adjust the seasoning. Plate greens, if using, and top with the barley mixture. *Serve.